Talk to me, Tivo: Andy returns from anger management classes, planning to make a fresh start with his coworkers; Michael and Dwight try to illustrate the dangers in the workplace. Jam Cam: Andy�s back! Or Drew. Whatever. Pam has no problem adjusting to the new Drew, but Jim is having none of it. I guess he wants someone else to try and punch him now. Or maybe Jim wants to get punched by Dwight, who wants Jim to act as a messanger between him and Andy. Bad idea. Now Andy thinks Dwight doesn�t know anything about bear attacks because that�s what Jim told him. Damn him. Down in the warehouse, everyone is being reminded how to be safe � and Kevin wants to make a bet with Jim. Too bad Kevin loses. Double or nothing on the next round! Whatever that may be. Oh look, that may be betting on how many jelly beans are in the candy dish on Pam�s desk. Everyone puts their guess in, including Karen, who bets one more than Jim as a strategy. Pam sides with Karen on that one, suprisingly. In the end, though, Jim gets the closest and Kevin complains it�s because he�s always hanging around the receptionist�s desk. Like hours and hours. Like so much that Jim and Karen look uncomfortable about the whole thing as Kevin yammers on. Hey, Karen, take the hint. Meanwhile, Pam gets cornered by Michael to support his claim that the office is just as scary as the warehouse. Pam wisely feigns stupidity, then suggests that it�s because their safety training had visuals. Oh Pam, why did you have to mention that? It�s going to give Michael ideas. Back in the office, the betting continues. 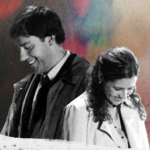 Kelly yammers on about something, Pam wins a consolation prize for the word �awesome� and Jim somehow bet that she would mention a bunch of romantic comedies. Why did Jim choose that? Oh, and another bet! This time, Jam is back to working together as Pam distracts Creed while Jim switches an apple for a potato. Nice job, Jam. They both win the bet � and once again, Karen is getting cleaned out. She says it�s because she doesn�t know the place very well, but we all know it�s just because she�s a loser. Outside, Michael is playing depressed with Jim and Pam looking on together and trying to decide the odds of this actually being real. What is real, apparently, is a big blow up castle. Oh yeah! Jim�s got a huge grin on his face as he looks over to Pam while standing in front of the castle. Jim seems to want to have a little fun�until Pam spoils it by realizing Michael is going to jump. And so, Jam work as one to do good and try to talk Michael down. Jim tries to tell him he�ll injure himself, Pam promises him a gift, and then tries to gets Dwight to go along with her to no avail. Too bad she didn�t give Jim a present like bouncing around in her skirt in the pink castle. The Others: There�s an accident in the warehouse, so Darryl has to go over all the safety protocols. Unfortunately, his job sounds much more dangerous than working in an office so Michael takes it upon himself to be overly dramatic by pretending to have depression and wanting to jump off the roof of the building. Who finally coaxes him down? Darryl. Go figure. Meanwhile, Andy comes back from his anger management training only to be shunned by Dwight. At least Dwight was able to unshun him long enough to get a bouncy castle for Michael. What have we learned today, kids: Safety first, gambling second, especially if the gamblers in question also like to play poker at a mock casino in the warehouse. Always remember � you can�t win unless you play the hand. Oscar: Really, ten? That’s your guess? You’re a professional accountant. Jim: There’s like ten green ones. Jim: I’m gonna say fifty. Jim: Oh, don’t be that person. Pam: It’s called being smart. Pam: 47, 48, 49. Jim wins! Kevin: That is not fair. He has spent hours up here at reception with you. Hours and hours. Kevin: No, constantly. Like, for years. Pam: What are the odds that this is in any way real? Jim: I’d say, like, 10,000 to 1. Pam: Oh God. Oh my God, he’s gonna jump. Jim: Oh. He’s going to kill himself pretending to kill himself. Jim: Hey, Michael. Don’t jump on the bouncy castle. You can’t do that because you’re going to get horribly, horribly injured. Pam [taking bullhorn]: Hey Michael. I have a present for you, but you have to come down and get it. Pam: Come down and open it and you’ll see. Michael: Dwight, find out what the present is. Dwight: OK, I don’t see anything. She might be bluffing. Dwight: Oh. It’s a Repliee Q1 Expo female robot, they’re only available in Japan. Michael: Dwight, you are such a liar. Pam, really, what is it?